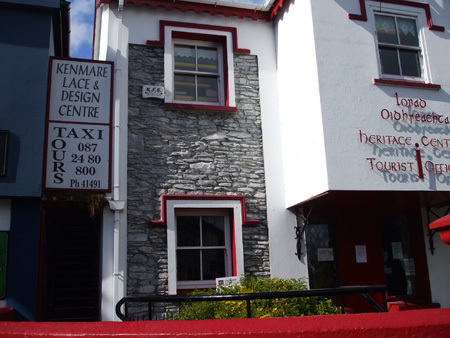 The Kenmare Lace and Design Centre can be found up stairs over the Tourist information Centre & Heritage Centre. It is accessed by the door to the left of the Tourist information Centre. The first thing that strikes one on entering the centre is the display of antique lace from the Convent of the Poor Clares Kenmare. This is for display only and not for sale. Most other items, except for the demonstration pieces can be purchased. On the back wall are vintage and antque pieces. These are sourced mainly from around the area, although we cannot always guarantee their origins. 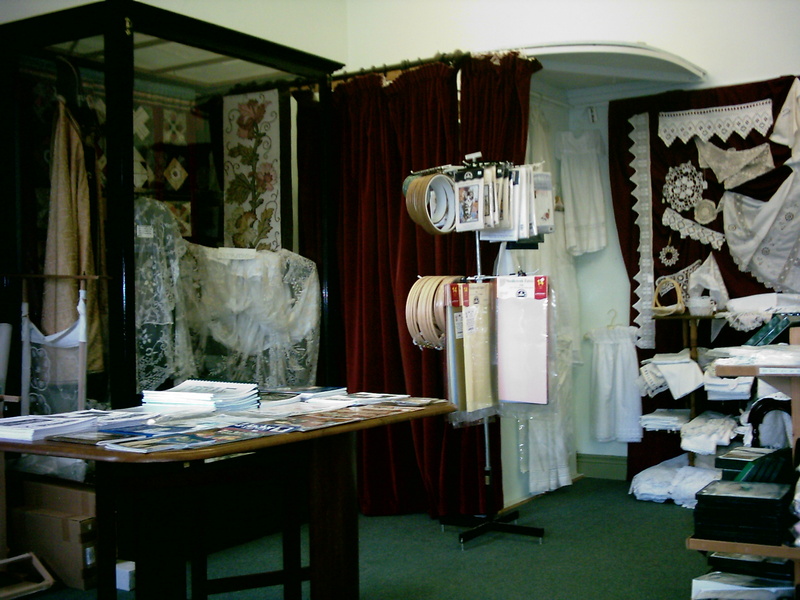 For those who would like a souvenir, but whose pockets do not stretch to a piece of handmade lace, we have some Irish machine made hankies, tablecloths, etc. These are displayed separately in the centre of the room. All the rest of the lace is handmade and mostly made locally. 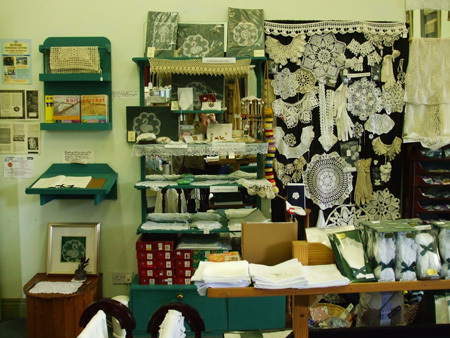 Anything not made locally we source mainly from members of the Irish Lace guild. All is made in Ireland. The demonstration table at the Kenmare Lace and Design Centre where you will be shown how all the Irish Laces are made. 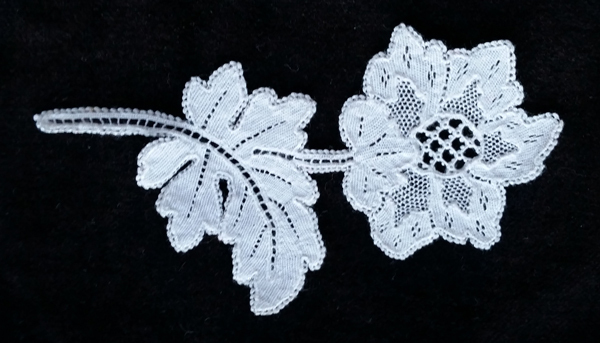 More of our locally made lace. 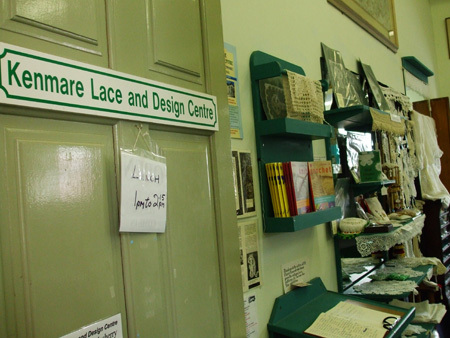 Some of the antique lace for sale at the Kenmare lace and Design Centre. 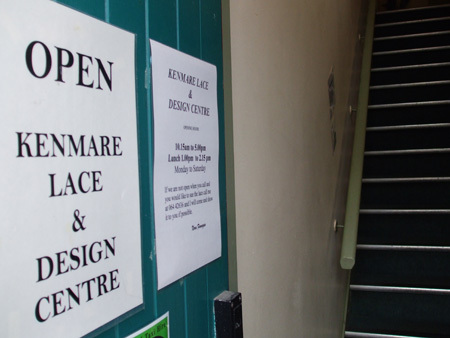 Some lace making tools available at the Kenmare Lace and design centre. For more information on Demonstrations, Click Here! To visit our Online Shop, Click Here!